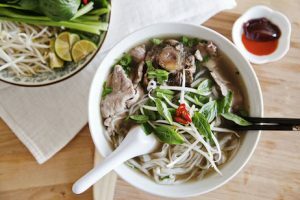 Food is at the heart of Vietnamese culture and Vietnamese food is one of the most popular cuisines in the world as it mixes together a range of flavors and tastes. 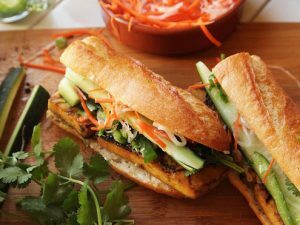 While street eateries are everywhere, as the city becomes more affluent, Vietnamese cuisine is going indoors. This simple meal, is one of the most popular dishes from South Vietnam at any time of the day, but particular in the morning. It is usually served grilled marinated pork chops, plus a mixture of thinly shredded pork and pork skin over broken rice. On top of the meat, there are several customary ingredients such as: finely sliced cucumber, tomato and pickled vegetables, along with prawn paste cake also known as steamed pork and egg custard or pork meatloaf with egg, fried egg, and grilled prawns. Banh Xeo are giant savory pancakes that literally translate to sizzling cake because of the noise they make when they are being cooked. 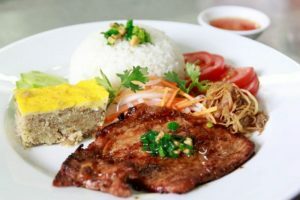 A good sizzling cake is a crispy crepe bulging with pork, shrimp, and bean sprouts, plus the garnish of fresh herbs that are characteristic of most authentic Vietnamese dishes. 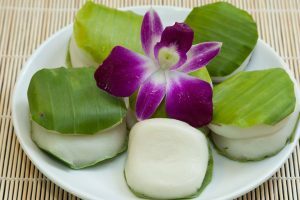 “Xoi”, or “glutinous rice”, “sticky rice” in English, can be found in many South East Asia food stalls or luxurious local restaurant. In Vietnam, Sticky rice is commonly popular breakfast item and give you a boost of added energy. 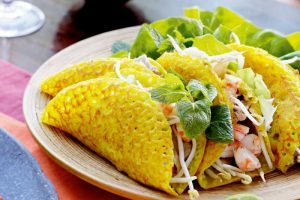 Vietnamese especially from the North, take pride in their steamed crepe made from rice flour and water. Ground pork, wood-ear, onion and seasoning are stuffed inside this savory meal. Most of the chefs make it right at the entrance door using the steaming method. 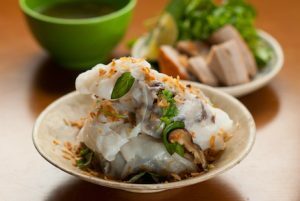 Banh cuon is served with a mixture of fish sauce including sugar and lime. 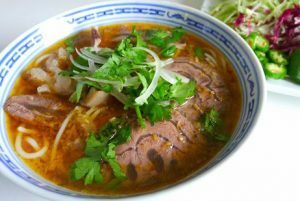 If you are a soup lover then you will be pleased to learn that Bun Bo Hue is another classic Vietnamese dish. Whether North, South or Central, “Bun” also creates unique and specific dishes in each region. Hue style not only is the elegant, sophisticated, precise dishes but also feel the spirit of the processor. Bun Cha is one of the oldest favorites of Northern Vietnam cuisine. 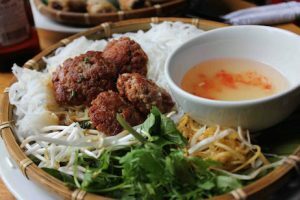 This dish is top choice of Vietnamese lunchtime food. Grilled chopped meat or normal grilled meat on charcoal stove is prepared with rice noodles and herbs. all together is dipped in syrup-thick fish sauce.Outside Hanoi, across all region of Vietnam, there is familiar dish called Bun Thit Nuong which alternatively served. 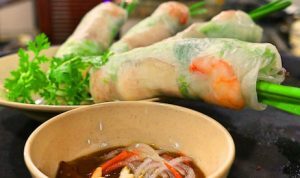 Salad roll ranks among Vietnam’s most famous foods and is very agreeable to the taste. 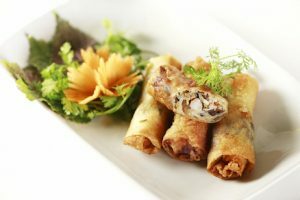 Each translucent spring rolls packed with greens, coriander and various combinations of minced pork, shrimp or crab. In some places they’re served with a bowl of lettuce and/or mint. A southern variation has barbecued strips of pork wrapped up with green banana and star fruit, and then dunked in a rich peanut sauce – every bit as tasty as it sounds. Banh Chưng is a traditional Vietnamese rice cake which is made from glutinous rice, mung beans, pork and other ingredients. Its origin is told by the legend of Lang Liêu, a prince of the last king of the Sixth Hùng Dynasty, who became the successor thanks to his creation of bánh chưng and bánh dầy, which symbolized, respectively, the Earth and the Sky (bánh chưng is the Earth and bánh giầy is the Sky). Considered an essential element of the family altar on the occasion of Tết Holiday (Asian Lunar New Year), the making and eating of bánh chưng during this time is a well-preserved tradition of Vietnamese people. Beside the tết holiday, bánh chưng is also eaten all year round as Vietnamese cuisine.